The PCE-313A humidity tester is designed for the professional use in the air-conditioning sector. This device determines both relative humidity and ambient temperature. 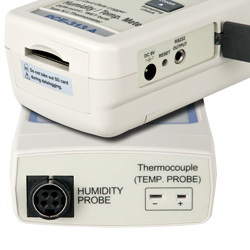 The PCE-313A humidity tester can be connected to type K thermo-elements to detect, for instance, the temperature of a wall by means of a surface probe. 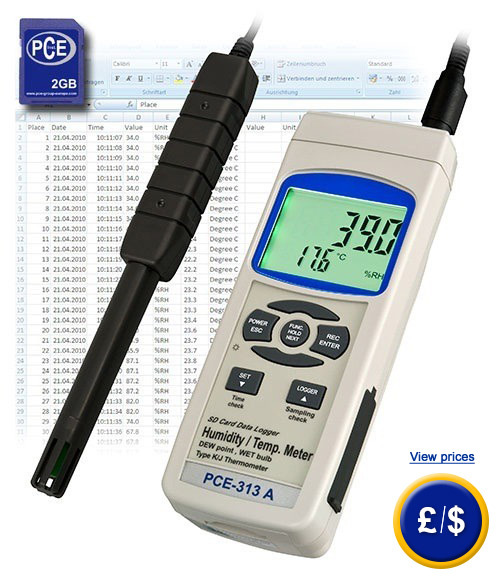 The internal memory of the PCE-313A humidity tester allows to record humidity and temperature values with a free adjustment of the measurement rate for real time measurements or data storage thanks to its SD memory card (1 to 16 GB). The PCE-313A humidity tester can be programmed beforehand via the keypad so the device can record values without the need of being present during the process. For long term records, we recommend you to power the humidity tester by means of a mains component (optional). 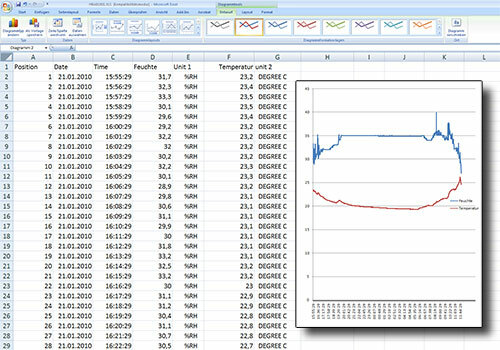 Recorded values can be transferred to a PC for further analysis (xls file in the SD card). This property allows to check measured values or design a graphic by means of the Excel calculation program. At the following link you can find another humidity tester with which you can measure relative humidity, temperature and dew point. Here is an overall view of all the humidity testers you might need. For high humidity environments the new version PCE-313S humidity tester with a sintered hood placed on both the temperature and the humidity sensor is available. We have provided the sensor for the PCE-313S humidity tester with a sintered hood to be used in adverse conditions without any delay in the measurement. 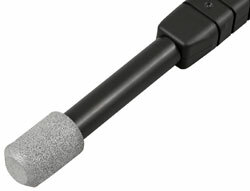 The sintered hood of the PCE-313S humidity tester can be removed to be cleaned, calibrated or tested. The image at the right shows the sensor with the sintered hood for the PCE-313S humidity tester. There is an optional piece of calibration equipment available for the PCE-313 A humidity tester. Humidity sensors become less accurate over time To ensure that values are always accurate, the humidity tester can be recalibrated using the calibration standards. These humidity standards have a value of 33% and 75% of relative humidity. This calibration can be done by people with limited experience using a humidity tester. - Measures humidity, dew point and temperature via the connection to a thermo-element. - Data is directly stored in Excel format in the SD card. software is required for data analysis). ≥70 % H.r.±3 % of the measurement value.. + 1 % H.r. 1 x PCE-313A or PCE-313S humidity tester (with sintered hood), 1 x combined sensor for temperature and humidity, 1 x SD card (2 GB), 6 x batteries and user manual. For companies that wish to incorporate the device into their internal quality control tools or for annual recalibrations (if not using the calibration kit). The ISO certificate includes a calibration and a document containing all the taken readings. The first calibration is done when the device is ordered and annual recalibration can be also performed. For independant calibrating of the PCE-320. The kit consists of two humidity standards (33 and 75% r.h.). Simply place the sensor in the standards and press a button. The software is required for transmitting data from the internal memory of the device to a computer. They can then be exported to other sofware such as MS Excel. USB cable is included. Mains component to use the device via the mains (230 V/50 Hz). Ideal for long-term registrations.